This weekend, the Chinese Grand Prix plays host to Formula 1's 1000th race. Like Bahrain, China made its first foray into Formula 1 in 2004. At a time of expansion of the sport, where it was moving away from its concentration on the traditional homeland of Europe, it was an obvious choice to head to the world's most populous country. The arrival of the world championship in China had been due to come some years earlier. Zhuhai, located in Guangdong Province in the south of the country, was built for F1 and on the provisional calendar for 1999, but did not meet the FIA's stringent standards. The debut race five years later was won by Rubens Barrichello in his Ferrari, while his world champion team-mate Michael Schumacher had a scrappy race, starting from the pit lane after spinning out in qualifying and then ending the Grand Prix in 12th after another spin, a collision and a puncture. In 2005, Shanghai hosted the season closer and newly-crowned first-time world champion Fernando Alonso took the race victory and helped to seal Renault's first constructors' crown. As he did the previous year, Michael Schumacher had to start the race from the pit lane after a collision with Minardi's Christijan Albers on the way to the grid. Schumacher subsequently spun out of the race. Speaking of Minardi, this was the final race for the Faenza-based team before its acquisition by Red Bull, who converted it into Toro Rosso and for Jordan who morphed into Midland the next year, before becoming Spyker and then eventually Force India. It was also the last time we saw a win for a car with a six-speed gearbox (many teams were already running seven-speed gearboxes that season, including Ferrari). In 2006, there had been talk that GP2 champion and rising star Lewis Hamilton would start his career as early as China, but in the end McLaren stuck with Pedro de la Rosa, a shrewd choice one would fathom, for Lewis hadn’t had much meaningful testing by that point. Michael Schumacher made amends for the last two Chinese escapades by winning and putting himself equal on points with Fernando Alonso, but ahead on countback to keep himself in the frame for the title (one he was not to go on to pull off). This turned out to be his 91st and last victory. It rained before the race and Schumacher, who had started in 6th, scythed his way through the field. Race leader Alonso's pace had dropped away dramatically in the wet and he had been passed by Michael, when he finally pitted for dry tyres and suffered a wheel nut problem, which put him yet further back. He eventually caught up with Schumacher, but could only finish runner-up, three seconds back. The 2007 Chinese Grand Prix bore witness to a dramatic denouement in the championship fight, as McLaren riskily kept Lewis Hamilton out on struggling tyres, in a bid to keep him in contention for the win, prompting him to wear them down the canvas. Lewis went into the race leading the championship by 12 points after Alonso had crashed out in the wet in Fuji. He was therefore in with a good chance of being the only person in history to take the championship in their maiden season. They arguably focused too much on the implications of the race in his battle with Alonso and didn't see enough of the threat coming from Ferrari. Kimi Räikkönen took the Chinese victory for the Scuderia, while Lewis's race ended frustratingly in a gravel trap on the pitlane entry. Ron Dennis made what were to become notorious remarks that “we weren't racing Kimi; we were racing Alonso”. In 2008, Hamilton took victory over Felipe Massa, setting himself up for the championship win he was to take by a whisker in the next and final race in Brazil, which so nearly slipped through his fingers again. The Shanghai race switched to the early part of the season in 2009 and Jenson Button and Brawn's dominance in the first seven races was only broken by Red Bull's first ever win here. Sebastian Vettel led Mark Webber home in a 1-2 and Button took the final spot on the podium in a wet race. The British national anthem was played erroneously for the Milton Keynes-based team, when it should have been the Austrian one, as that is where the team is registered. Following his switch of teams, it was Jenson Button who topped the podium in 2010, this time making it a McLaren 1-2 after a race in wet conditions, with Lewis Hamilton second. It was the first British 1-2 since 1999 (Irvine and Coulthard in Austria) and the first English 1-2 since 1969 (Hill and Courage in Monaco). Following this fourth race in the championship, Jenson was leading the championship again. In practice, Sébastian Buemi's front upright broke, causing both his front wheels to come off, in a bizarre-looking accident. The next year, Lewis Hamilton only just avoided having to start from the pitlane, as he left for the grid with 35 seconds to spare following a fuel problem. He went on to win the race with three stops, becoming the first driver to take two wins in Shanghai, beating Sebastian Vettel and his two stops. Lewis's team-mate Jenson Button lost time when he stopped at the Red Bull pit on Lap 15. Nico Rosberg had often gone well in China and in 2012 he took his first Grand Prix victory and the first win in the modern era for Mercedes-Benz, by almost 21 seconds from the McLaren pair of Hamilton and Button. Rosberg's team-mate Michael Schumacher, who had qualified third, missed out on a potential high finish, after retiring when his front-right was not fitted properly during a pit stop. In a race with heavy degradation, Fernando Alonso took victory with Ferrari the following year. Despite being the largest country in the world by population, a Chinese driver has never raced in Formula 1, although Ma Qinghua participated in Free Practice for Caterham and also did some free practice sessions the previous year with HRT. 2014 saw Lewis Hamilton top the podium and lead home a Mercedes 1-2, with the chequered flag erroneously being waved a lap early at the end of Lap 55. This saw the race result declared as things had stood at the end of Lap 54. In 2015, Hamilton was the first driver to get back-to-back Chinese Grands Prix victories as he again showed Rosberg the way home. A year later, Rosberg sort of turned the tables on him, taking victory from Vettel and Daniil Kvyat. Kvyat’s Red Bull team-mate Daniel Ricciardo had beaten Rosberg into the first turn but dropped back after a tyre failure on Lap 3, eventually coming home in fourth. The next season, Lewis Hamilton beat Sebastian Vettel, while Max Verstappen had a superb drive from 19th on the grid to complete the podium. Last year, 6th-placed starter Daniel Ricciardo overtook Valtteri Bottas to take victory. Vettel collided with Verstappen and ended up in 8th, the latter of whom had earlier lost a place to his Australian team-mate after running wide. The Toro Rossos of Brendon Hartley and Pierre Gasly tangled. 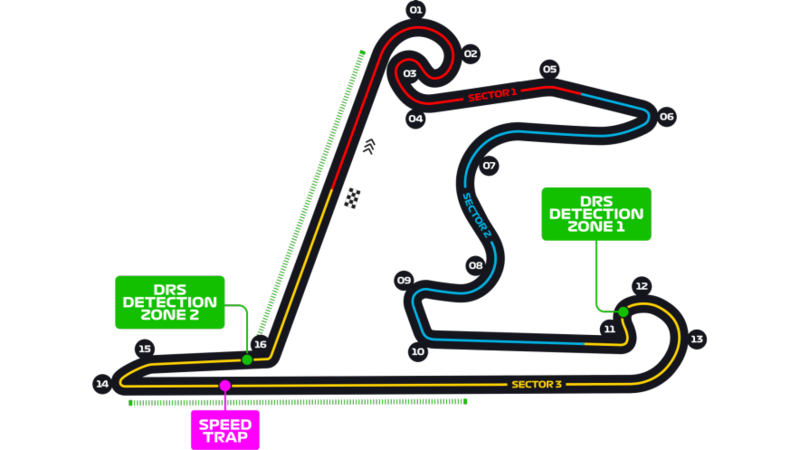 The Shanghai International Circuit, one of Hermann Tilke's creations, has a layout based on the Chinese symbol 'Shang' - 上 - the first character in the name of the city itself, which means 'above', 'ascend' or 'high'. In a further nod to Chinese symbolism, standing aside the main grandstand are the two traditional Chinese lions often found in front of*the country's buildings, guarding the guests, while water, a major factor in the decorating concept of feng shui, is present in the form of the lake which encircles the team buildings. It would be fairer to call these team pavilions, as they were crafted to resemble Shanghai's ancient Yuyan Garden. The circuit offers up an interesting challenge to the drivers and teams, with some long, winding curves where finely-judged throttle control and decent aero stability are an asset, in addition to long straights where they will want as little drag as possible. It is quite a front-limited track. Turns 1 and 2 are basically one long corner, albeit with two apex points. Into the first one, drivers go down the gears to about 6th as they touch the apex, before patiently letting the car roll through the corner and dropping to as low as 2nd gear before hitting the second apex. The front-lefts work hard here and are prone to graining. Hitting the Turn 3 apex, the car is then just kept level as they go through Turn 4 (effectively making it one corner with Turn 4 just an exit of Turn 3), before the slight kink at 5. Braking downhill into Turn 6, drivers then approach a faster section. They head for the most intense complex, approaching Turn 7 with quite a late apex and keeping some throttle down during the turn before getting fully back on the power and swinging right into 8. A short straight is followed by Turns 9 and 10, where it is easy to lock the fronts on the entry, two slower left-handers following in quick succession, which lead onto a significant straight. Heading into Turn 11, a left-hander, drivers soon need to be getting it into 12, as they hit DRS Detection Zone 1 and go through this long, long right-hander which takes them through to Turn 13 too, a continuation of this. After the longest straight on the circuit (1.17km) and DRS, they jump on the brakes between the 150 and 100 metre boards and go through the tight and then more open rights at Turns 14 and 15. Drivers pick up the second DRS Detection before the final corner, which is a quick left-hander which favours those prepared to risk it and carry a lot of speed in the curve. Braking a bit early here can be an advantage as the corner is short and quick and hurls the drivers back onto the start-finish straight. If any driver gets his first pole here, he will be the 100th different Formula 1 polesitter in the 1000th Formula 1 race. The 2016 edition of the race saw the most official overtakes in a dry race in history yet – 126. Another brilliant intro BR. Thank you. Great read again! I almost always miss this race because of the stupid start time. But the track itself is great and offers lots of opportunities for good racing. So, here we are at the 1000th GP miles-stone, at a track so badly attended that the organisers cover entire empty grandstands with huge taupaulins. Meanwhile the British GP remains under significant doubt, the German one is limping along etc. I know, it seems the circuits and countries that made F1 are under threat, while those that add nothing continue to thrive. Not right is it? not sure if this has been asked/answered already but what dates and races are they using to calculate the 1000 races? would be curious to see a list. i suppose it doesnt really matter as its a nice story and while i do really enjoy races here im pretty sure they could have made more of an effort to 'manipulate' the number and have the race at a more iconic/better attended venue. but thats probably just me complaining for the sake of complaining. totally forgot about that...proximity to Macau, tourist destination etc might have been a better location attendance wise at least. anyways should be an excellent race. early season and lots of unanswered questions about the order of things! I know of at least 1 race in 1980 that was deleted from history afterwards. If you mean Spain 1980, it does not appear on the Grand Prix calendar of 1980 on F1.com, and is listed separately as a non championship race. ie It is not included in the 1000 championship races. Looking forward to how this unfolds. Can Leclerc get that debut win, after bitter disappointment in Bahrain, or can Vettel get it together and get that first win of the season. That was the first major conflict of the FISA-FOCA war. Jean-Marie Balestre announced that the 1980 Spanish GP would not count as a championship round, after drivers in FOCA teams didn't show up to driver's meetings at the previous 2 GPs. He subsequently stripped the drivers of their racing licenses. It was also a nail in the coffin for the Spanish GP at Jarama, which hosted the race for the last time the following year. Autosport has an article on just this. Should it be F1 1000. There is a missing GP as mentioned, but then also many that weren’t F1 (Indy and the F2 world championship races). But there were many of non championship F1 races. So is this 1000th F1 Grand Prix, or the 1000th F1 race?